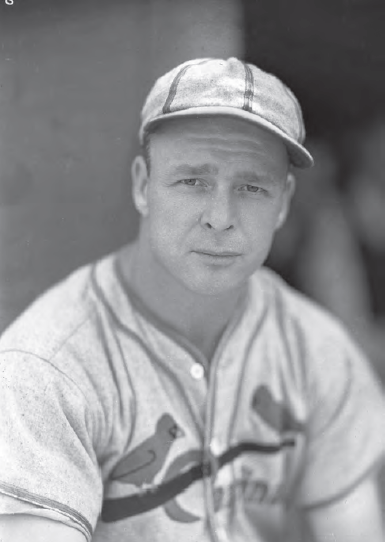 There may have been no one more surprised to find Chick Fullis playing for the St. Louis Cardinals in Game Seven of the 1934 World Series than Fullis himself. Fullis, who had been brought to the Cardinals in mid-June in a trade with the Philadelphia Phillies, had primarily played as a platoon right-handed hitter and defensive replacement with the Cardinals. But after the two miscues in Game Five, Cardinals manager Frankie Frisch clearly lost any confidence he had in Fullis. It seemed doubtful that Fullis would see any playing time in the remaining two games. However, the Cardinals roared back with a win in Game Six. In Game Seven St. Louis took a 9-0 lead going into the bottom of the sixth when Tigers fans, incensed by a hard slide into third base by the Cardinals’ Ducky Medwick in the top of the sixth, pelted Medwick with anything they could throw when he took his position in left field in the bottom of the inning. Baseball Commissioner Kenesaw Mountain Landis ordered Medwick off the field for his safety. To replace Medwick, Fullis entered the game, undoubtedly surprised and relieved. He acquitted himself well, playing errorless ball and singling in his only at-bat as the Cardinals beat the Tigers, 11-0, to win the World Series. And while he didn’t exactly become the hero of the Series, thanks to his Gas House Gang teammates he definitely was able to shed the goat horns. Charles Philip “Chick” Fullis was born on February 27, 1901, in Girardville, Pennsylvania, in the coal-mining region northwest of Reading. He was the youngest of five children of Barbara (Schaefer) and Charles W. Fullis. His father, a miner, was the son of German immigrants and his mother was born in Germany. Fullis stood only 5-feet-9 but was powerfully built with broad shoulders. He was listed at 170 pounds. He was a speedster on the basepaths. It’s no wonder he caught the eye of the Frederick (Maryland) Hustlers of the Class D Blue Ridge League, who signed him for the 1924 season. Also, sometime during this period, Fullis changed the year of his birth from 1901 to 1904, so instead of being a 23-year-old professional baseball rookie, he was listed as 20 years old. He claimed the 1904 birth year for the rest of his career. After the season Fullis was sold to Portsmouth of the Class B Virginia League. He refused to report, demanding more money. Portsmouth may have also been too far from home for Fullis. Finally, in April 1925, Portsmouth gave up on Fullis and returned him to Frederick. Frederick again sold Fullis after the season, this time to Columbus of the Double-A American Association for $4,000. And again Fullis refused to report, again saying the contract amount was too small. Clearly, Fullis impeded his own route to the major leagues by refusing assignments, especially with Columbus, which was just one rung below the majors. Unfortunately, Fullis started the season in a badcslump. He was 2 for his first 26 at-bats and was benched with an .077 average after just seven games. It didn’t help that the Phillies lost all seven games. Fullis was returned to the starting lineup about a week later and promptly started hitting. He raised his batting average to .263 by May 18 before an injury forced him out of the lineup for nearly three weeks. When he got back, he again slumped. This time the Phillies had enough. On June 16, in a swap of outfielders, Fullis was traded to the Cardinals for Kiddo Davis, the second time the two were involved in a trade together. Eventually, the Cardinals outbattled the Giants and Cubs for the pennant. Fullis saw action in Game One of the World Series as an eighth-inning defensive replacement for Orsatti. He got an at-bat, singling in the top of the ninth in the Cardinals’ 8-3 win. Fullis didn’t play again until he was inserted into the starting lineup for the ailing Orsatti in the fateful Game Five. In the second inning, he misplayed a Pete Fox single into a double, allowing Hank Greenberg to score from first, putting the Tigers up 1-0. He wasn’t charged with an error on the play, however. Then in the sixth, a groundball single went through his legs for a two-base error, allowing Billy Rogell to get to third base. Rogell scored on a sacrifice fly by Greenberg, putting the Tigers up 3-0. The Tigers won the game, 3-1, their third victory of the Series. Without Fullis in the lineup the Cardinals won Game Six, 4-3, and then helped Fullis shed the goat horns by winning Game Seven, 11-0. Fullis played in that game only because Landis had ordered Medwick off the field for his own safety. For the Series, Fullis was 2-for-5 in three games. 1. Brooklyn Eagle, October 8, 1934. 2. The 1940 US Census lists Fullis as going to school only until the eighth grade. He may have played for the high-school team yet not attended school. The Sporting News, April 4, 1946; Lane, “He Lost Out With the Champions,” Baseball Magzine, August 1934, 300; Frederick (Maryland) Daily News, June 27, 1924. 3. Lebanon (Pennsylvania) Daily News, March 29, 1946; Lane, “He Lost Out,” 300. 6. Frederick Daily News, September 16, 1924; Frederick (Maryland) Post, March 26, April 29, June 2, August 4, and September 9, 1925. 7. Frederick Post, October 11, 1925, and April 1, 1926; Hagerstown (Maryland) Daily Mail, February 26, 1926. 8. Frederick Post, May 19, 1926. 9. Frederick Daily News, September 13, 1926; Frederick Post, September 21, 1926. 10. Frederick Post, June 3, 1927; The Sporting News, August 11, 1927. 11. The Sporting News, April 4, 1946; Rockford (Illinois) Republic, August 2, 1927; Augusta (Georgia) Chronicle, June 1, 1929; Doug Feldman, Dizzy and the Gas House Gang (Jefferson, North Carolina: McFarland, 2000), 54. Unlike Fullis, Jake Levy never played in the major leagues. 12. Frederick Daily News, August 6, 1927. 13. Augusta Chronicle, March 6, 1928; Berkeley (California) Daily Gazette, March 15, 1928; Winnipeg (Manitoba) Free Press, March 16, 1928; New York Sun, January 10, 1929. 14. Greensboro (North Carolina) Daily Record, July 7, 1928. Buckeye pitched one game for the Giants and was shelled. It was the last game of his major-league career. 15. Seattle Daily Times, December 19, 1928, and January 10, 1929; Aberdeen (South Dakota) Evening News, April 1, 1919. 16. Bob McConnell and David Vincent, SABR Presents the Home Run Encyclopedia (New York: Macmillan, 1996), 536; New York Times, May 7, 1929. 17. Brooklyn Standard Union, May 10, 1929; Richmond (Virginia) Times- Dispatch, June 30, 1929; Cleveland Plain Dealer, August 11, 1929; The Sporting News, August 22, 1929. 18. Oregonian (Portland, Oregon), March 2, 1931. 19. San Diego Tribune, December 10, 1930; Boston Herald, July 7, 1931; Yonkers (New York) Statesman, July 22, 1931; The Sporting News, July 2, 1931. 21. Seattle Times, December 3, 1931; Rockford (Illinois) Register-Republic, December 19, 1931. 23. William McNeil, Black Baseball Out of Season (Jefferson, North Carolina: McFarland, 2007), 100; Barthel, Baseball Barnstorming, 134, 219. 24. Cleveland Plain Dealer, December 13, 1932. 26. New York Sun, June 14, 1933; Oregonian, March 17, 1934. 27. Feldman, Dizzy and the Gas House Gang, 53-54. 28. Boston Herald, March 20, 1935; Baton Rouge State Times, January 1, 1935. 29. Omaha World-Herald, May 11, 1936; Lebanon Daily News, March 29, 1946. 30. Greenville (Mississippi) Delta Star, February 1, 1938; The Sporting News, February 3, 1938; Rockford Register-Republic, April 14, 1938; Greensboro Daily News, April 17, 1938. 31. Lebanon Daily News, June 9, 1939; Jamaica (New York) Daily Press, July 1940; Brooklyn Daily Eagle, August 17, 1940. 32. Harry Humes, “The Girard Theater,” Now and Then, Winter 1997, 19; Lebanon Daily News, March 29, 1946. 33. Pennsylvania Death Certificate for Charles P. Fullis; Lebanon Daily News, March 29, 1946.